My 7th jump for charity at WSC is coming up on June 3rd. It’s a special place. You feel it as soon as you walk in: the family atmosphere, picnic tables, the gas grills, the friendliness of everybody there. I live about an hour away. There’s a much closer dropzone to me, but I choose WSC. As a matter of fact, over the last several years, I have been fortunate to share this experience with over 70 of my friends and family at WSC. Some of them have only jumped once, but many of them are still jumping. I don’t want to say anything bad about other dropzones, but I think that at other dropzones a person will just do a tandem skydive, land, get in their car and go on with their lives. At WSC, most people stay for hours – just enjoying the atmosphere and watching everybody else. Every time I go, Bo and Alex are very friendly, and all of the staff come up and shake your hand or give you a hug. It is an amazing little business. I think everybody that jumps there becomes part of their family. They really make you feel that way. I’m originally from southwest Iowa. We moved to Wisconsin in 1964. My dad took up trap shooting back in Iowa, as a hobby; Remington Arms hired him as a professional trapshooter salesman for the state of Wisconsin. Right outside of town was a little airport called Reabe’s Airport. As a kid, I remember going out there and watching people parachuting at that airport – with the big parachutes, the rounds, not like the ones they have today. I never thought I would ever do it, but it was always fun to watch. When I started out, I was in retail sales. I had a clothing store back in the 70s. We specialized in menswear for young men and adults. Back then, everybody wore suits. We sold a lot of suits. I miss those days. When I bought into the clothing store in 1973, it was a gold mine. We had a good business. In 1978, leisure suits came out. That started to affect our business. Then the recession hit. It took me about a year to decide to sell out, which I did. Three years later, they went out of business. After the clothing store, I worked in the Department of Corrections. I saw a lot of violence; sadness. That job was an adrenaline surge every day you went to work. I did that for 30 years and retired as an Assistant Superintendent-Captain. Afterwards, I missed some of that adrenaline. In that position I conducted investigations for the Department of Corrections, both internal and external. I also assisted in investigations with county, state and federal law enforcement agencies. After I retired, I just needed some excitement in my life. I am not a big fan of heights. Let’s be clear: I’m not afraid of heights, but I am not a real fan of them. The first time I tried something akin to skydiving, we were down in Florida. A couple of our friends came down to visit us, and they wanted to parasail. I said I’d come along. We only went up 1,200 feet, but to me that was high. I enjoyed it, but like I said, I wasn’t a real fan of heights. So of course I did it. I did it three more years after that one, too. Every time it was scary. I wasn’t comfortable with it, and it was only seven stories up. But each year I did it in honor of a Special Athlete. One year, it was for my nephew, who has Down Syndrome. Then it was for a lady in town who has special needs. They are all Special Athletes from the Special Olympics. It was neat to do it in their honor, and we raised about $10,000 dollars. As far as skydiving is concerned, I’d have to say that I’ve been inspired by the stories of others. There’s Melissa Jahnke, for instance – she’s a coach at WSC. The video they shot of her skydiving story really inspired me and pushed me over the edge to sign up for the first time. Melissa’s story starts shortly after her dad passed away. Then she had a baby and was diagnosed with postpartum depression. One day, she saw an ad for WSC and decided to give skydiving a try. After her very first jump she no longer took drugs for post-partum, and she has been jumping for five years now. Then there was another lady: Anna Mae Milner. She’s 83, and she’s a cancer survivor. Each time she jumps for charity, she writes down the names of the people she has lost to cancer and keeps the note in her pocket, so she jumps in memory of them. One day, I got done with my yard work and was sitting in the garage with my phone. An ad came up for the Wisconsin Skydiving Center. There was a picture on that ad of a guy jumping out of a plane. I said, There’s an idiot. But then I looked at the land and terrain. When I fly, I love sitting in the window seat and looking at the terrain. I went back and forth, debating if skydiving was for me. 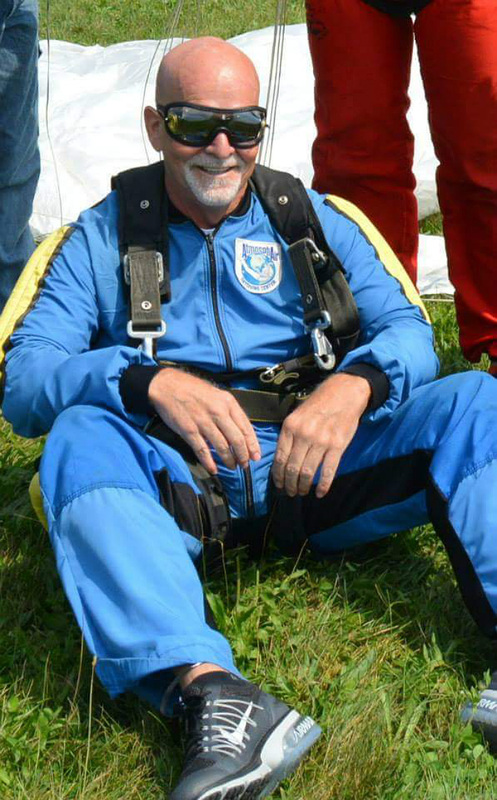 About 30 minutes later, I marched into the house and told my wife: “I have been retired for four years and need some excitement in my life, so I am going skydiving.” She looked at me and smiled. We got a small group together. We all went down to WSC and jumped – and loved it. Every time we hit altitude at 10,000 feet and the door opens, I have second thoughts – but that dissolves immediately in freefall. As everybody says, freefall is just amazing. Then the chute opens up and you can enjoy the peace and quiet. On one of my jumps, I could see all the way from Madison to Lake Michigan. That was incredibly beautiful. A friend of mine at that time, Chuck, had been fighting cancer for approximately three years. He had heard about our jump for charity. Later that summer he saw me at a soccer game with my grand kids. He told me he wanted to skydive; asked me when I was going to do it again. I told him September. He wanted to create memories with his two adult children. So that time, we had a group of 10 or 11 that went down. Chuck was going through chemo at the time. Last year, my granddaughter – who was going to graduate from high school – asked me if we had gotten her anything for graduation yet. When I said not yet, she asked for a skydive. For her graduation gift, we bought skydives for her and for her mother. Ten of us jumped as a family that day. A high school friend of mine is a breast cancer survivor. She was instrumental in getting the pink fire trucks to come to Oshkosh, if you remember that. 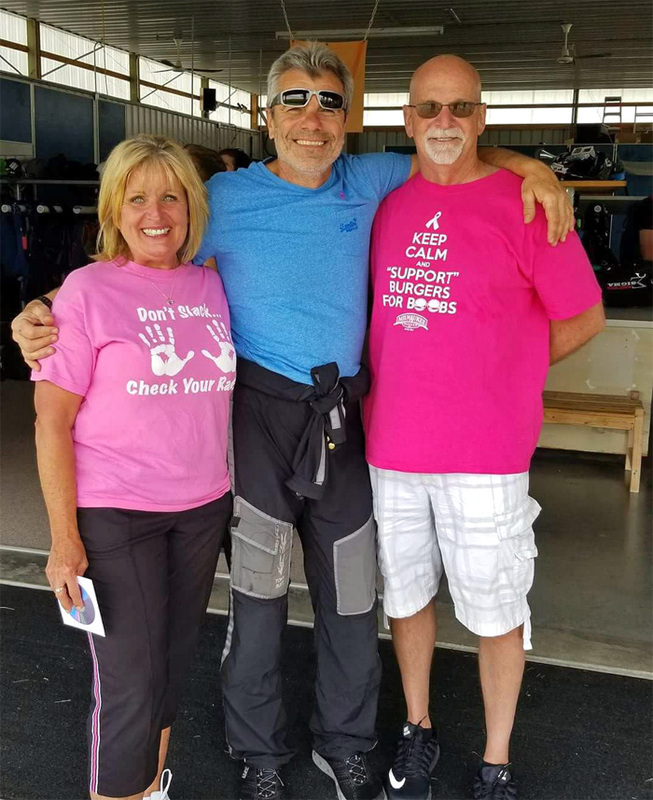 She came along on my last jump for charity to cross skydiving off her bucket list, and so we all decided to make it a “pink day.” All of the jumpers wore pink in honor of breast cancer survivors, and those who lost their battle with the disease. 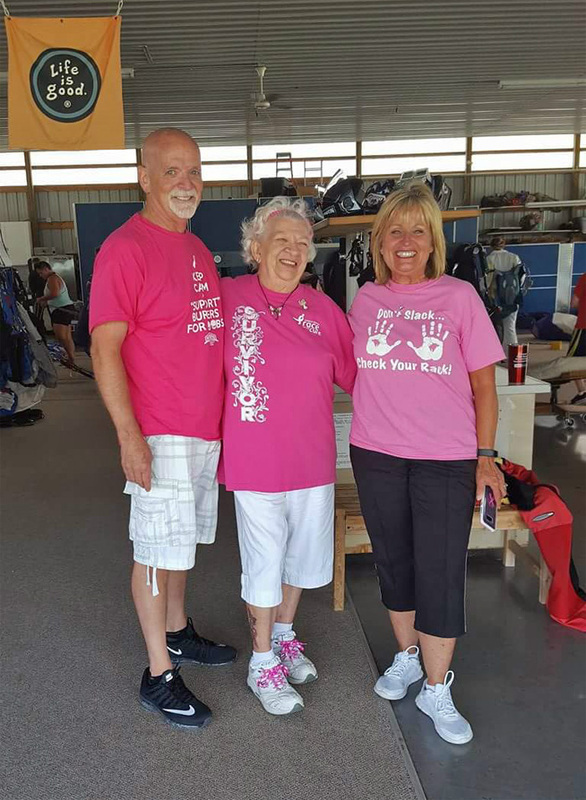 June 3rd will be our second annual “pink day.” Hopefully we are going to have 20 people skydiving in the group by the time it’s all said and done. There’s always the question of safety. But, honestly: I cycle a lot in the countryside, and skydiving is safer than cycling… with cars passing you, and all. I just feel it’s safer. Despite the fact that I don’t love heights, I’m very comfortable up there. Each time I get up to altitude, I think to myself: Why am I doing this? And then, once the door opens, I understand that this is why I do this. 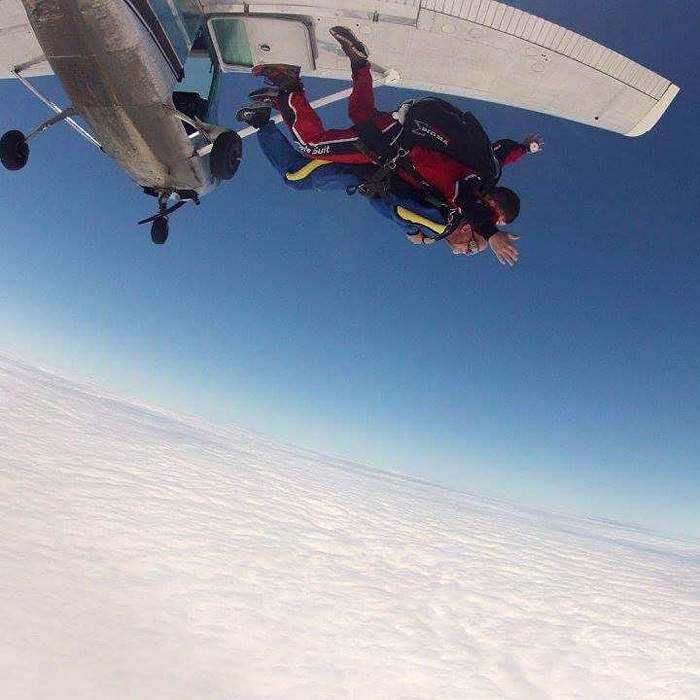 It’s hard to explain the feeling that you have when you skydive – the freedom once you exit the plane. 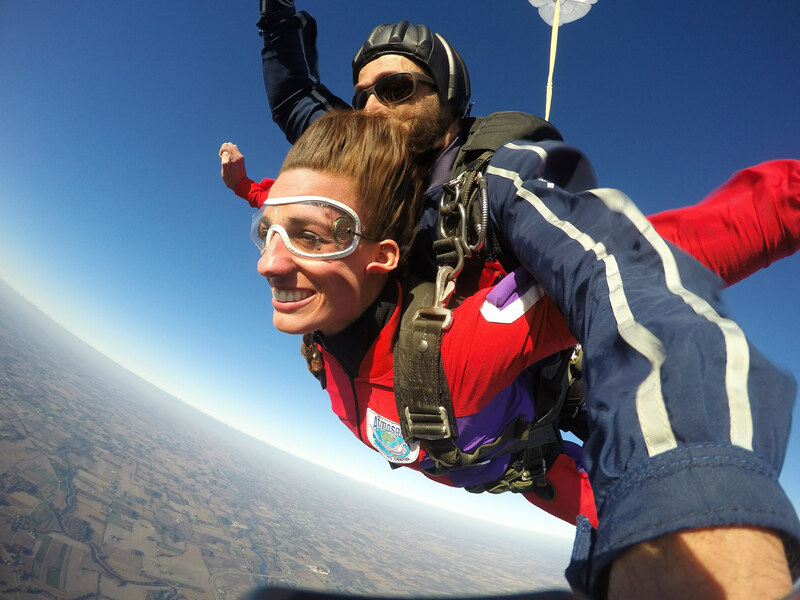 I think everybody should skydive at least once. I’m sure that most people would jump more than that after they get that feeling. And then, once you land, to see all of the smiles and the emotions and excitement… it’s priceless. I’m going to keep jumping for charity, for sure, and I’m a true believer in WSC. What’s it Like to be Married to a Tandem Instructor?